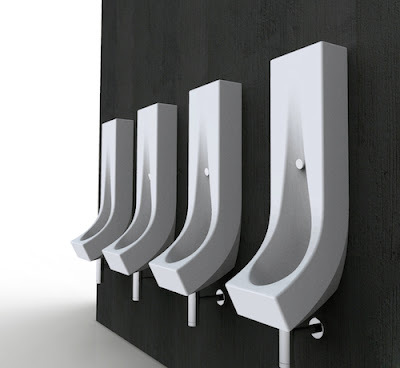 Check out the Drop urinal from Hidra. Hidra developed the Drop specifically for the residential market, they didn't adapt a commercial one for home use. That's how most residential urinals come to be by the way. A manufacturer takes something that's meant for heavy use and scales it back a little bit. Hidra took another tack though, and the Drop never had an incarnation as a commercial product. To make it easier to fir into existing baths, the Drop has been made slimmer and taller. It's also a pretty attractive piece of porcelain. For the life of me, I will never understand the widespread rejection of urinals for home use. Having half the population flush 1.6 gallons of fresh, potable water down the drain every time they need to dispose of about a pint of liquid is one of the more absurd practices of modern life. It's a terrible misuse of resources and people continue to do it because of a strange unease around urinals. Sometimes that unease is warranted but not for the reasons you may think. I was in Spain with my great friend Bob Borson earlier this year and he had encounter with a urinal in Valencia that has to be read to be appreciated. Anyhow, back to the business of urinals. Think of it this way, if there's a man or men in the house and there's a urinal present, toilet seats can be kept down. That alone would make the divorce rate plummet. If you're contemplating a bathroom remodel and there are men who will be affected by the renovation, consider installing a urinal in your new bath. 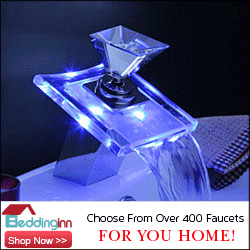 The men involved will be thrilled and you'll cut down your water use significantly. At this stage of the game, who wouldn't welcome a lower utility bill? You can find the Drop and more cool bath stuff on Lazio-based Hidra's website. Love this one, Paul- you know I'm totally on board with the residential urinal. Thanks for keeping it at the front of mind. Paul, just continue to fight the good fight! We are a family of 6. Unfortunately it's 5 women and just me as the lone male. If we had boys I can only imagine how much money we would save in water. Of course, since I can't get any of the women in this house....TO FLUSH....our water bill continues to remain at a decent place, considering our size. I'll push for these things so long as there's breath in my body. I suggested a urinal in his powder bath and he was horrified. Strange. That is strange. The only people I know who have them are gay men. Go figure. Paul, that is one nice-looking urinal! I had a totally hetero male client that asked me to remove the bidet in his master bath & replace it with a urinal. He (and his 2 sons)LOVES it. It really is a good idea from a water-saving viewpoint and I think new homes should have plans with them in. But it's the same as bidets. Some people can't even explain what it is without blushing. Can't figure out why. I have this one bookmarked in my RSS feeds. Really great design. Seems he woke up in the middle of the night when nature called, and wandered into his ensuite to answer. A few minutes later he felt his wife's hand on his shoulder, trying to rouse him from what he thought was a deep sleep. He was, in fact, on the floor of the ensuite. Apparently he had passed out while standing at the toilet. He spoke to his doctor later that day, and apparently this is an issue for us men as we age. The release of bladder pressure in the middle of the night can cause a rush of blood away from the head and subsequently cause one to pass out. The solution? (wait for it ladies) Sit down while you pee at night. We use urinals all the time in our projects - well, not all the time but maybe 25% of the time. Even more shocking is that we sometimes put them in a wet room - i.e. a room with the tub and shower in the same tiled space. You would be surprised that as weird as that may sound, everyone who has it raves about how great it is. I just figured that men simply like to pee in the shower. I must admit, the comments to this post have me rolling on the floor. While I'm fond of the look and approve of the utility savings, you still need a toilet and I think Arne is on to something. Every time I have a meeting in the afternoon a conversation springs up here that I miss. Pooh. Or should I say Pee instead, considering the topic here. Thanks everybody for chiming in. This is the best read I've had all day, and I'm not even in the toilet. Maybe people are reluctant because they think they are open and therefore not clean? Seems a little bus-stop-y? Of course, this design is er, lovely (can one say that about a urinal? ), so it is nothing against that. I think once Martha Stewart or Bath & Body Works starts selling urinal cakes, the home urinal will become mainstream. Martha Stewart urinal cakes? Now that's something I'll bet even Martha's never thought of. Pretty sweet looking piece of porcelain Paul! Once we buy a place you can be damn sure I will have an office/groom-room that will feature one of these bad boys. Urinals have a place in resindential design these days IMHO. Especially with the "right-sizing" & resource conservation trends only getting stronger. I've been looking for inspiration to do a urinals piece in answer to Bob's. Kudos, sir! You beat me to it.